Unlike the FT and the majority of western media, Nikkei and other Japanese publishers still sell a huge number of newspapers in print, and are seeing a much slower decline in print sales – partly due to the place newspapers have in Japanese culture and partly due to a highly developed home delivery network. Everyone knows that newspapers have to make the inevitable transition to digital, but this robustness of print sales combined with the relative popularity of native apps over the mobile web, means that modern, progressive and performant web apps are a rarity in Japan. Set against this, Nikkei’s decision to pay over a billion dollars to buy the FT looks amazingly forward thinking. Although owning the pink ‘un will yield English language content to extend Nikkei’s reach globally, the experience of transitioning to digital (a majority of the FT’s subscribers now read us only digitally) is equally important. Over the last few years the FT has transformed, and now understands that its product is both content and technology, and the two are inseparable. Technology has become a focus like never before, spawning multiple open source contributions: Fastclick became the defacto mechanism for making web apps responsive on mobile browsers, Data squasher was an insane hack that inspired some smart people to solve a real problem in the web platform, and with Fruit machine we created a framework on the same principles as Facebook’s React, but a year earlier. Our community polyfill service, a project jointly sponsored by the FT and Fastly, is improving compatibility on thousands of sites across the web. We’ve increased our outreach with events like London Web Performance and Edge conference. The FT went from being rarely seen at developer conferences to being one of the most recognisable presences in the community. At the 2014 Velocity conference, there were five separate FT speakers (more than Google); and the London Web Performance meetup now brings smart developers together at the FT’s offices every month. We’re able to escape old technology, which is regularly turned off and unceremoniously booted out of the company. “Enterprise” solutions are being scrapped and replaced with more rapidly developing open source alternatives. We’re building a new ft.com for tomorrow’s online society, and we invest in experiments – things like chatbots, linked data visualisations, and alternative paywall concepts. Editorially we were a print-first newspaper that later repackaged print content for the web, now we’re a digital content company that repackages to make a newspaper. And this is all relevant because….? Nikkei wants all of the above, but better and delivered faster. When the FT acquired Assanka, the consultancy business I founded with Rob Shilston, they were buying not just the expertise to maintain stuff we’d built for them (primarily the FT Web App) but were also taking a shortcut to a more developer-centric culture. Nikkei is pulling the same trick but on a marginally larger scale. 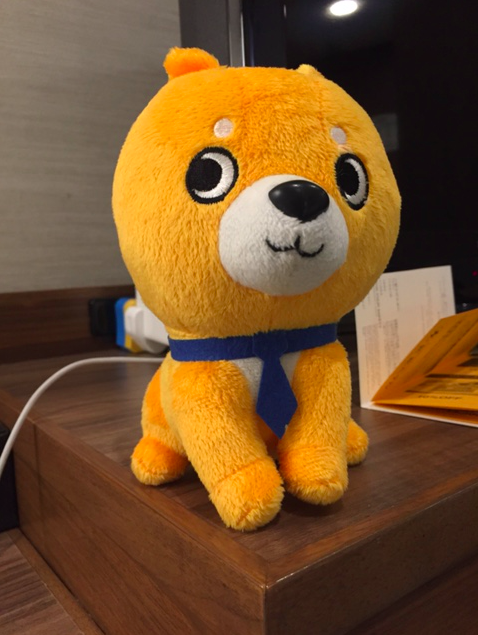 Obviously Nikkei has a mascot. So what I hope to bring to Nikkei is experience in building for digitally savvy audiences, organising engineering teams, encouraging innovation, engaging the developer community, component systems, and the lessons my colleagues have learnt in building next.ft.com. Nikkei aims to become not only an outstanding example of web technology in Japan but a rival to the best of western publishers as well. That would sound ambitious, if it weren’t for the quality of the engineers that make up Nikkei’s nascent technology team, most of whom are not only comfortable in at least two languages but also know four alphabets and the multiple associated keyboard layouts, as well as a breathtaking array of technologies. They can do this stuff without me, for sure, but hopefully I can offer a few useful lessons from the FT’s experience. Spectacularly breathtaking mountains, cherry blossom season, incredible autumn colours, zen gardens, a world class public transportation system, an utter obsession with technology and probably the best cuisine on Earth. So, yup, where do I sign. Sadly this means there will be no Edge conf 2016, but London Web Performance will continue to be run by Perry, and it will still be hosted at the FT where my colleague Patrick Hamann will take over hosting duties. I still work for the FT, and I feel extraordinarily lucky to be able to continue to do that while also having the opportunity to do this crazy thing. At some point I’ll pinch myself and realise it’s all a dream and my TPS reports are overdue. Until then, see you in Tokyo.